I’ve been to Park City’s Sundance Film Festival four times now. Or, rather, I’ve been to Park City during Sundance four times. Up until this year I’d never actually seen a movie or chased a Hollywood celeb around Main Street—and why people enjoy the latter of those two things I will never, ever understand. My annual trips to Park City during Sundance have only happened because my friends organize the Sundance trip to end all Sundance trips, and have been doing so for 11 years now. Seventy-plus people, mostly from San Diego, pack into a multitude of condos around town, but only after executing a flawless Good Will Hunting-worthy math equation system of ticket purchasing in the weeks ahead. They’ve got a website, e-mail newsletters, a welcome party, a theme party (this year’s was Saturday Night Live costumes), and probably a few too many drinking games for any right-minded 40-ish crowd. In other words, this group has Sundance down to a science. Personally, I’ve always just skied…usually feeling a “bit dusty” (as my Aussie mates would say) from the night before. The social side of Sundance can do that to you, even if you aren’t an A-lister…or even a Z-lister. The bowl off the top of the Ninety-Nine 90 chair at the top of the Canyons area of Park City. You’ve likely heard that during Sundance is the best time to ski the mountains of Park City, and that’s no lie. An influx of L.A. and New York showbiz types and, I would imagine, the lofty rental and hotel prices during the film festival, seem to keep many out-of-town skiers and boarders away. With Park City and Canyons now one GIANT resort (called Park City Mountain) connected by the new Quicksilver gondola, the room to roam is plentiful at any time. When the slopes are nearly empty, it’s like skiing at Solitude. On Wednesday, we kicked things off on the Park City side of the resort, and were gifted 6-8 inches of fresh snow to play in. At the base of the Quicksilver gondola on the PC side is the Miners Camp, a brand-spanking-new on-mountain restaurant and bar with beautiful wood décor. We popped in for a quick plate of chicken tenders to keep us fueled up until last chair, then made our way to Jupiter Bowl, lapping it up in the trees for several hours. The day concluded with a long run into town, across the ski bridge and right to a bar on Main Street for beers and more chicken—this time of the wings variety—in our ski boots; as it should be. Powder, no lift lines, cold beer and wings; not to sound like a simpleton, but the foundation for a solid week was in place. Thursday and Friday were spent chasing leftover powder stashes in the trees on the Canyons side of Park City Mountain. The underrated tree runs off the Saddleback Express and Tombstone Express lifts are always good for hidden, leftover powder turns, and they didn’t disappoint on what was a sunny, almost spring-like morning. On Friday, I’m mildly embarrassed to say I did what people do when they come to Park City for Sundance. I strolled. Up and down Main Street we went, looking for…actually, I don’t know what you look for; famous people doing things that regular people do perhaps? Slipping on ice, eating lunch, etc. What I realized is that Sundance is an exercise in branding. Main Street stores have been taken over for 10 days by brands hoping to make a splash during the film festival. From the Kickstarter “store” to the Acura tents, it’s a study in event marketing. The highlight for originality was probably the AirBnB Haus, billed as the place “where strangers meet”. That sounds appealing and borderline illegal, until you remember you’re in Utah and the place isn’t open after dark. A huge, vibrant temporary paint job adorned the outside of the building and attracted passers-by to venture inside. The interior featured two floors of comfortable seating areas and even a place for Vinny Chase from Entourage to do an interview with someone from somewhere who wanted to know something. Unfortunately, E, Drama and Turtle were nowhere to be found. And I bet no one asked him where they were all week, either. Farther up the street, after lunch at the Wasatch Brewing Company, we stumbled upon Danny DeVito. That’s not an expression; if you’re not careful, you could trip over him. He graciously posed for a few photos with fans and made a couple of NY-style wisecracks. That evening, we caught a free acoustic show from two members of the band O.A.R inside the very upscale Gorsuch ski shop on Main Street, which is evidently owned by the band members’ friends. I need a friend who owns an upscale ski shop. I need to be in a band, too. The show was an intimate, great-sounding acoustic performance for all of 40 people who happened to walk by or follow the band on Twitter. An only-at-Sundance sort of thing. Saturday afternoon marked the beginning of 12 solid hours of snowfall that would leave more than a foot of freshies in the upper elevations. 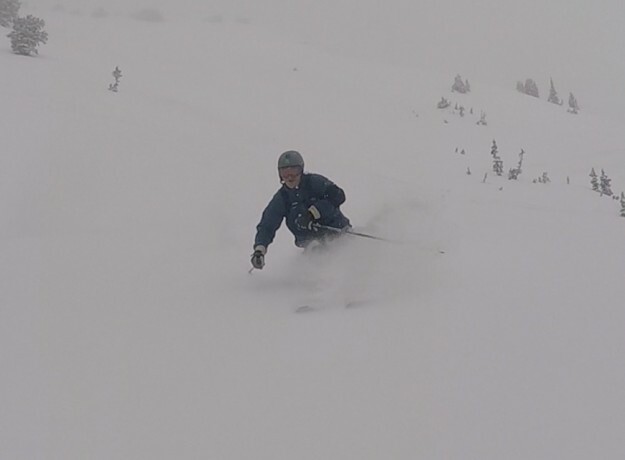 It was incentive to ski until 4 p.m. as the snow stacked up quickly during the final two hours of daylight. It was also all the motivation needed to avoid a late Saturday night. Park City serves up some splendid fare, and a 16-ounce ribeye at the Butcher’s Chop Shop and the accompanying bottle of Malbec perfectly aided the sleeping plan. There aren’t many downtowns in the ski world that look as magical during a snowstorm as Main Street in Park City under the lights, even with Uber drivers angling for street space like it’s the final lap of the Daytona 500. On Sunday, we were on the hill by 9:15 a.m. (lifts open at 9) and the conditions were perfect. We ventured to terrain we hadn’t touched in the previous three days, heading straight for the glades off the Dreamcatcher lift, which offers a formidable pitch and some tight turns between aspens at the top, perfect in a foot of fresh powder. Again, lift lines were all of 12 seconds. After a couple of hours, we made our way across the mountain via the Dreamscape lift and eventually to the Ninety-Nine 90 chair, which deposits you at the highest point of what would have formerly been known as Canyons—you guessed it, 9,990 feet up. For the first time all week, a liftline awaited us. This was a concern. The Pats/Broncos AFC title game was kicking off at 1 p.m. and the plan all along was for this lifelong Pats fan to be on a barstool at kickoff. We inched our way toward the chair for 10 minutes, wondering what could cause a wait at 11:30 a.m. for an experts-only chair during Sundance. At the top, as we made the short hike to access the open bowl just beyond the area gates and into 94 turns, the answer was obvious—patrol, after bombing the bowl all morning, had just been opened the peak. Or, in local parlance: “the top had popped.” A thousand feet (that’s a guess!) of powdery vertical awaited below and we dove in with only a handful of tracks in sight. The snow was of the light and fluffy variety that they say allegedly only grows in Utah. 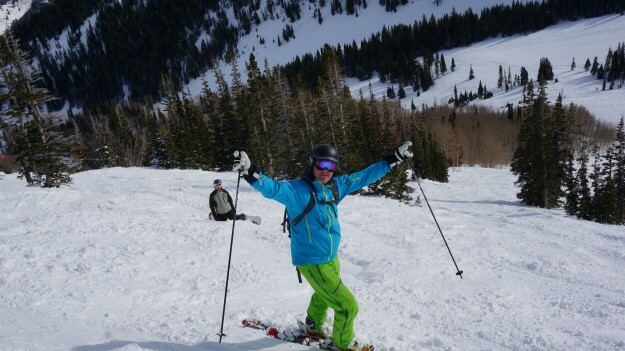 Tim Sweeney was an award-winning reporter for The Vail Trail many moons ago. To read more of Tim’s witty travel yarns, subscribe to his blog on his website here http://timsweeneylive.com/?page_id=2. And look for more of his travel stories on Real Vail. 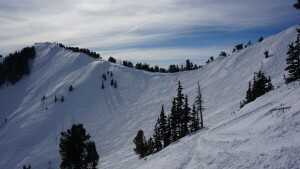 The author enjoys the benefits of skiing Park City during the Sundance Film Festival, when the lines are short and the powder is deep.